The storm brought the power of heaven with it. Bolts ripped across the Crest. Thunder flooded the world with a sound that cut deep inside my heart. All of it let me know how small I am. I sat hunched below a ridge, cowering in a low dip between two spires of volcanic rock that rose behind me. 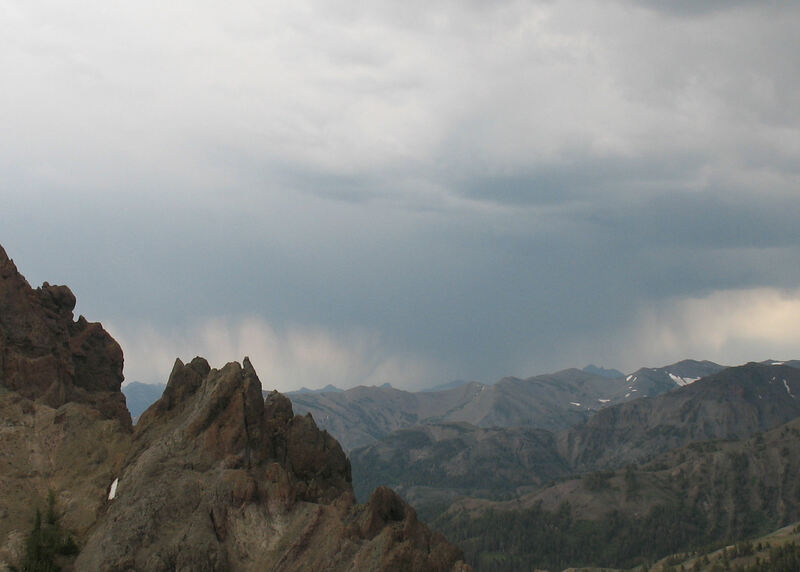 In front, the view was open, dropping away across Sonora Pass, leaving a storm-raged string of mountains to the south. They looked like an angry ocean, waves frozen in place, the sea turned to stone in the middle of a storm. It could have been a theater, a movie, but there was no screen, no line of fiction protecting me from my fear. Every Greek sat with me, every Viking, every ancient culture that looked to the sky and saw a god. The storm closed around me. Bolts crashed to the earth wherever I turned my head. I pulled my body onto my foam sleeping mat, hoping I’d make a poor target for the electricity shredding the sky. It was all I could do. In each direction, the trail rose to ridge crests and a steep mountainside hung below me. I sat and waited, making peace with it all and watching the sky explode. Counting, counting, always counting, waiting for a break and a chance to escape before the storm found me. My chance came from the north, an island of light in the sea of darkness. The clouds pulled apart and sun spilled through. I was up in an instant, scouping up my pack and racing toward a canyon on the far side of the ridge, hoping the storm would wait before snapping its jaws shut again. I scrambled over and I took one last glance back. I wanted to remember. It’s not every day you can watch the gods pass by. Posted in Pacific CrestTagged gods, lightning, Pacific Crest, PCT, thunderBookmark the permalink.